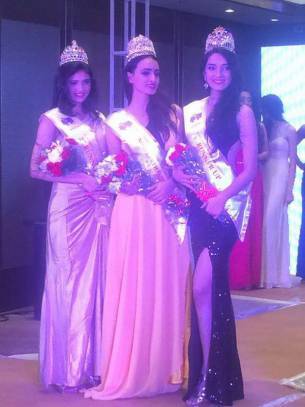 Aaital Khosla won the Miss Earth India 2015 title during the Miss Glamalands event held on November 4. It is the first ever pageant designed to select solely the representative of India to the Miss Earth pageant. Vaishnavi Patwardhan is the first runner-up while Jolly Rathod is the second runner-up. Aaital Khosla is taking up a course at the prestigious The London College of Style. She is originally from Chandigarh but currently lives in Delhi. She already won in various national pageants and was a finalist at the Femina Miss Delhi pageant. Aaital will now represent India at the Miss Earth 2015 pageant which will be held in Vienna, Austria on December 5, 2015. India is one of the strongest nation at the Miss Earth pageant. It has one winner – Nicole Faria in 2010 – and with two first runners-up. The franchise was originally owned by the Femina Miss India group but this year, the Glamanand Entertainment Pvt. Ltd took over under the leadership of Nikhil Anand.